The NBI train is starting to roll. Lots of posts popping up, Doone is doing a bang-up job working on a permanent new home for the organization and at last we have our first actual New Bloggers! 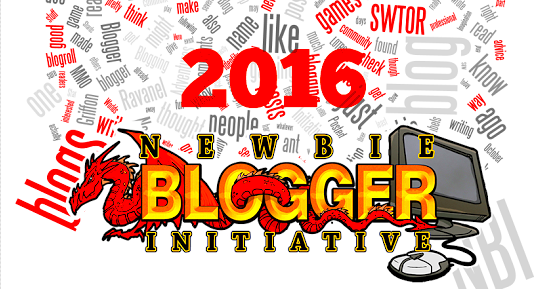 All added to the blogroll and tagged NBI 2016. I thought that last one sounded familiar. In fact I was certain I knew the name. When I went to add it to the roll Blogger wasn't having any of it. I scanned down the list and sure enough, there's Pleasant Gamer already, tagged NBI 2015. I'll be adding all this year's intake to the Blogroll as they arrive, just like last year and the year before that. There are currently just under 100 blogs on my blogroll. I don't know if Blogger has a limit. I think I might find out soon though. I'd just like to add a few words on the subject of Blog Rolls. If you're the kind of blogger who cares about things like page views, a good blog roll is a fantastic asset. Blog rolls are incredibly useful for gauging the temperature of the blogosphere and spotting hot topics that are crying out for you to bandwagon enrich with your own eloquent and incisive insights. A blogger in possession of a good blog roll is never in want of an idea for a post. It's not plagiarism - it's community spirit! Better yet, a good blog roll is a destination in itself. People will use your blog as a stopping-off point in their daily round or flip to it when they're bored at work just so they can carom off onto whichever blog on your list might just have updated. I used to do it all the time before I had my own blog and I still use my own blog roll that way when I don't want to log into Feedly for some reason or other, which happens more often than you'd imagine. My blog roll has grown to a seriously unwieldy length, although nothing like the insane descender of my Tag Tail. I used to worry a little about that but I'm past it now. Blogger seems immensely resilient as a platform when it comes to untidiness, which is one of the main reasons I like using it. Everything new floats to the top without my having to do much, or indeed anything, to keep it that way. If you go for Wordpress or self-host then you'll have a lot more work to do if you want a blog roll that updates in real time. It certainly can be done - Wilhelm at The Ancient Gaming Noob (who posted his own thoughts and advice on blog rolling for the NBI of 2012) has such a blog roll and he's blogged in some detail about the fun he had getting it to work, too.